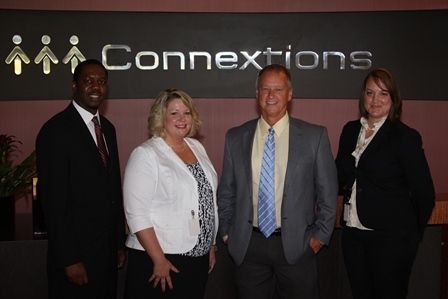 Jeffersonville, Indiana – July 17th, 2012 – Connextions, located at the River Ridge Commerce Center, announced today their plans to hire more than 300 licensed insurance agents for their Jeffersonville location. The company will also offer free education to prepare qualified individuals for one of the fastest-growing career sectors in today’s economy. Connextions, a leading technology and business services partner to the health care industry and part of UnitedHealth Group’s Optimum health services businesses, helps the nation’s leading insurance carriers enroll, retain, and serve their members. The company is hiring 300 health agents at its Jeffersonville facility in response to increased demand for health coverage. With a current nation-wide workforce of over 7,000 employees, the company operates solution centers in Orlando Fla., Concord and Charlotte, N.C., Centennial, Colorado, Irving, Texas, and Jeffersonville, Indiana. The insurance sales sector is projected to grow 22 percent over the decade ending in 2020, faster than the average for all occupations, according to the U.S. Bureau of Labor Statistics.